Hawaiian BBQ Meatballs make the perfect fun, easy party appetizer or you can enjoy them as a main dish, served over rice. Make them in the Slow Cooker OR on the Stovetop. These Hawaiian BBQ Meatballs are one of those fun foods that double as an appetizer or a main dish. 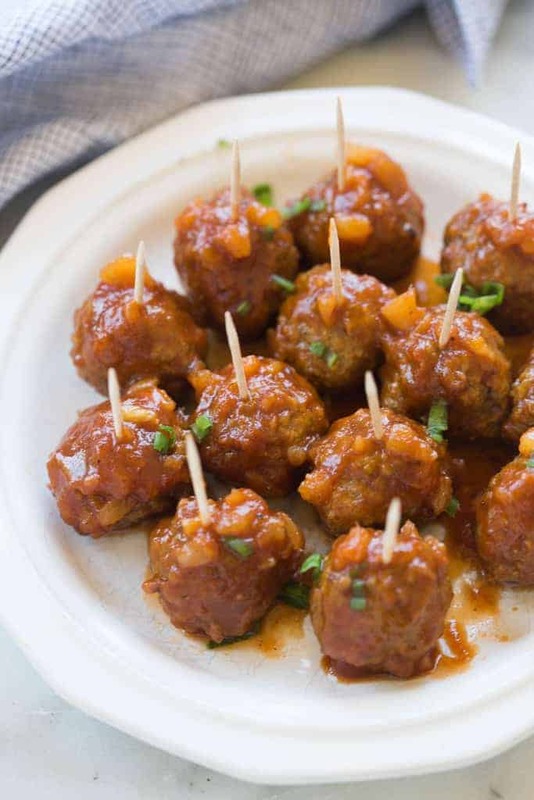 You can make a big batch in the slow cooker and bring them to a party–everyone loves a tasty meatball for party food! You could also make them for dinner and serve them over rice. 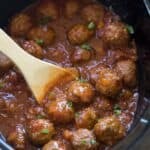 My favorite part of these meatballs is the tangy-sweet combination from the pineapple and the AMAZING homemade bbq sauce. (You can definitely use store-bought bbq sauce, but the homemade sauce takes it to a whole new level)! Spray the bottom of your slow cooker lightly with cooking spray. 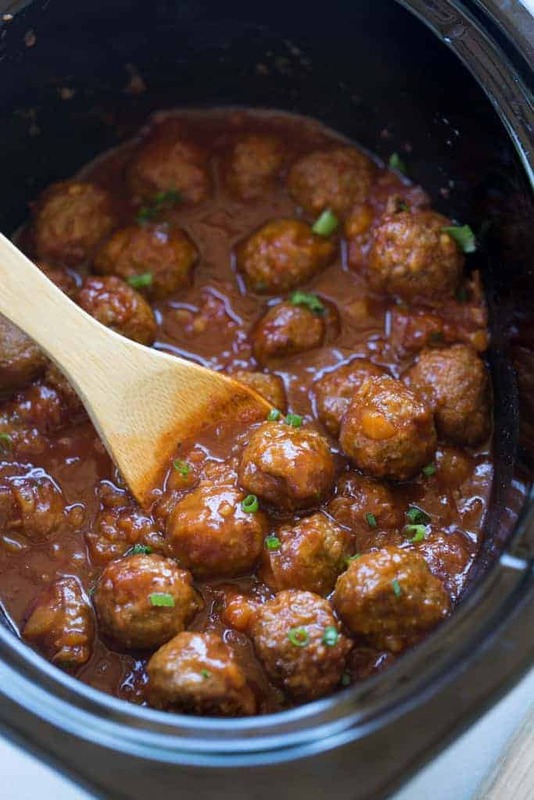 Add frozen meatballs to the bottom of pot. In a large bowl stir together homemade bbq sauce and crushed pineapple. Pour over meatballs. Cook on LOW for 4-6 hours or HIGH for 2-3 hours. Serve warm garnished with chopped green onions, if desired. Add homemade bbq sauce and crushed pineapple to a medium pot. Cook for 8-10 minutes for thawed meatballs, or 14-16 minutes for frozen meatballs. Serve warm garnished with chopped green onions, if desired. I found these on Pinterest and love them! Thank you so much Lauren!!! So easy! I just threw it in the crockpot for lunch and it was quick and yummy! Love these Hawaiian BBQ meatballs! I made them to bring to a New Year’s Eve party and people asked me for the recipe…just made them again for another party and received many compliments. I always make extras to keep handy in our fridge in a plastic container — quick snack to microwave or heat up and serve with brown or white rice for a quick dinner! Your recipes are awesome!